There’s little doubt that Portugal is a design lover’s paradise, jam-packed full of interior inspiration and, of course, stunning Portuguese azulejos tiles. Around every corner you’ll find glazed ceramic tiles adorning every surface. From eye-catching church frontages and metro station walls to hard-wearing benches and fountains, they’re at the forefront of Portuguese culture. They even decorate the outside of people’s homes. Azulejos tiles tell stories and create interest where, in other countries across Europe, walls might be left blank. It’s no wonder they leave us feeling inspired for our own home. The word azulejos comes from the Arabic “al-zuleique”, meaning “small polished stone”. Dating back to the thirteenth-century, designs started with geometric shapes in neutral tones, used to fill spaces on large, gothic walls. They often featured modest depictions of birds and leaves, inspired by fabrics imported from overseas, and the foreign influence didn’t stop there. King Manuel I of Portugal brought inspiration back with him from Seville, and those geometric shapes morphed into the azulejos tiles we know and love today. It was after an earthquake in Lisbon in 1755 that the use of azulejos across Portugal started to rise. During the rebuilding of the city, the tiles moved from inside walls to out, covering religious monuments and palaces, community hubs, restaurants, bars and railway stations. Not limited to wealthy, urban centres, the popularity of azulejos tiles spread nationwide into rural areas too, used in villages to cover street signs and beach walls, framing the doorways and windowsills of family homes. Through this beautiful but practical tradition, it’s become a Portuguese custom to share stories. 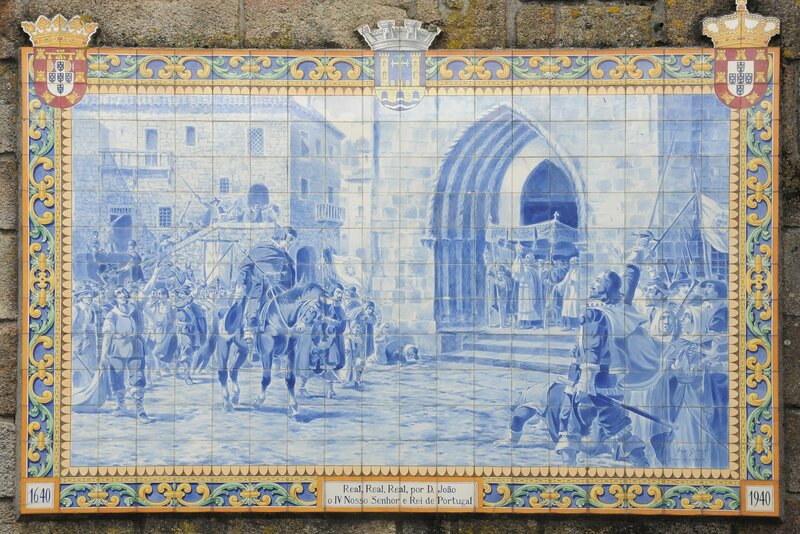 Over time artists have depicted religious fables, historic events and cultural celebrations on the ceramic surfaces of Portuguese tiles, alongside small messages of remembrance and protection from the elements. Without age, and seemingly above trend, azulejos tiles have changed with the times but remain a constant, too. Walk the streets of Lisbon and you’ll see nods to Art Nouveau, Art Deco, the transfer-print methods of the nineteenth century and much more. And if you need any more convincing that Portuguese azulejos tiles live on today, as recently as 1988 a collection of modern artists were commissioned to decorate Lisbon’s newest metro stations with the famous ceramics. We’re no strangers to using a little inspiration when it comes to designing our own homes. In particular, Portuguese blue tiles play a big part in the game of trends with inspired designs often found in the bathroom, kitchen and hallway. From our own collection, the V&A Brompton tile with its timeless blue tones and Laura Ashley Mr Jones in midnight both offer striking designs that are reminiscent of the streets of Lisbon. Perfect for adding a touch of azulejos into the mix. We love the idea of combining these iconic blue tiles with concrete surfaces or white marble for a more authentic European feel. Consider taking things to the next level, too, with wooden blinds or a reclaimed door to finish off the look. If you find your guests snapping pictures of your tiles when they visit, then you’ve captured the beauty of Portuguese culture perfectly.